Mirrored Metallic: Dyad 07 features a unique clip with metallic evergreen mirrored lenses in polished gunmetal wire. The frame is our popular pepper tortoise, hand-polished to a perfect finish. Slate aluminum side inlays complete the classic look. The frame itself features clear lenses, and is RX friendly, should you wish to add your prescription. Additional clips are available in our accessories section. Divine Dyad: Dyad is a classic acetate frame with round lenses and a keyhole bridge. Each frame is meticulously handmade in Japan and features high-quality shatterproof lenses with 100% UV protection. The Dyad shape was designed to be flattering on all faces. Its super-durable construction and smooth, high-quality hinges ensure these will be your favorite shades for years to come. 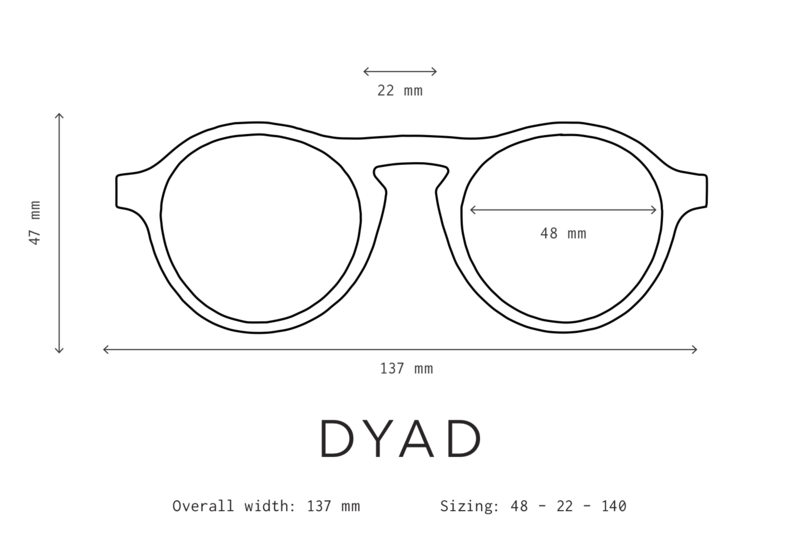 The Dyad frame is perfectly described by its name, “Dyad,” meaning the combination of two elements, in this case the round frame and accessory clips. This versatile, retro-cool shape celebrates styles of the past and establishes trends of the future.